Fascinating. Clearly I have a new book to buy. So I'm going to be in Brooklyn on May 19-20 for my sister-in-law's sister's wedding on the 20th. 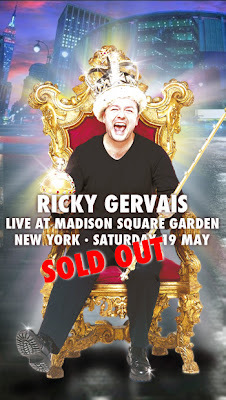 Yesterday I read that Ricky Gervais was going to be performing at Madison Square Garden on the 19th. Despite this image's (courtesy of RickyGervais.com) assertion, Ticketmaster came through for me, and I got 2 seats in the center mezzanine. I guess they released some new ones. Rock on.